One of the Healthy People initiative’s key roles is to identify research, evaluation, and data needs. The National Center for Health Statistics conducts two assessments for each 10-year initiative. These midcourse and final reviews provide an opportunity to see the initiative’s impact along the way. The 5-year review for Healthy People 2020 was released in January 2017 and can be found on the CDC website, at https://www.cdc.gov/nchs/healthy_people/hp2020/hp2020_midcourse_review.htm. 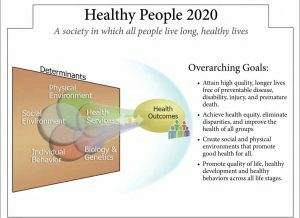 Healthy People 2020 Framework. Graphic from www.healthypeople.gov. How much money people spend on housing can have a meaningful impact on their well-being. Economic experts recommend that families spend no more than one third of their income on housing, so that adequate funds are available for other expenditures. Studies show that spending more than half of a family’s income on housing puts householders at high risk of losing their home. The Midcourse Review shows that more people are being affected on both measures, suggesting that, overall, Americans are not doing as well in terms of economic stability as they were 5 years before. From 2007 to 2011, the proportion of households that spent more than 30 percent of their income on housing rose from 35 percent to 38 percent; in 2011, Hispanics/Latinos were the racial/ethnic group most at risk. Householders with less than a high school education, with low family income, with a disability, or who lived in metropolitan areas were also at higher risk. From 2007 to 2011, the proportion of households that spent more than half of their income on housing increased from 16 percent to 18 percent. Householders who were African American had less than a high school education, were poor, or lived in nonmetropolitan areas were at higher risk. Today, having a college education is important for getting a job and staying employed. The Midcourse Review showed that, unfortunately, the percentage of young people going to college after completing high school is lower than it was a few years ago. Individuals ages 16–24 who had completed high school and enrolled in college the following October decreased from 68 percent to 66 percent between 2010 and 2013. High school completers from low-income families were less likely than completers from high-income families to enroll in college right after high school graduation. Having health insurance is an important part of making sure that people can afford access to an ongoing source of healthcare when they get sick. The Midcourse Review showed that more people under the age of 65 have insurance now than they did in 2007 and that people of all ages are more likely to have a source of ongoing healthcare. In addition, more people than before say that they can understand their doctor or nurse’s instructions. The proportion of people under age 65 with medical insurance increased from 83 percent in 2008 to 87 percent in 2014, and the proportion of people of all ages with a source of ongoing care increased from 86 percent in 2008 to 88 percent in 2014. The proportion of people age 18 and over who reported that their healthcare providers’ instructions were easy to understand increased from 64 percent in 2011 to 66 percent in 2012. Under the well-known “broken windows” theory, an orderly environment signals that an area is monitored and that criminal behavior is not tolerated: Neighborhoods with a strong sense of cohesion assert social responsibility and control by fixing broken windows and other small but visible problems. Air quality and lead levels are important indicators of a clean and safe environment, and crime rates are an indicator of social cohesion. Between 2008 and 2012, there was a decrease in the rate of arrests of minors and young adults ages 10–24 for serious violent crimes (from 444 to 324 per 100,000 population) and serious property crimes (from 1,527 to 1,223 per 100,000 population). Days when the Air Quality Index (AQI) exceeded 100 (weighted by population and AQI) decreased from 2.2 billion to 982 million between 2006–2008 and 2012–2014. Also, lead levels in blood samples among children ages 1–5 years in the 97.5 percentile decreased from 5.8 mcg/dL to 4.3 mcg/dL between 2005–2008 and 2009–2012. Social support is especially critical for children and adolescents, who are in their formative years. New items that may be measured in the final review of Healthy People 2020 include civic participation, incarceration, and discrimination. The proportion of adolescents ages 12–17 who reported having an adult in their lives with whom they could discuss serious problems rose slightly, from 76 percent in 2008 to 78 percent in 2013; however, it is striking that almost a quarter of adolescents did not report having such an adult in their lives. 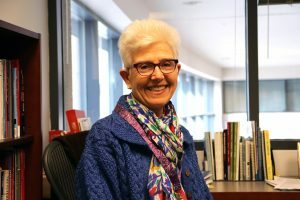 Overall, the Healthy People 2020 Midcourse Review underscores a basic fact: Improving the social determinants of health and mitigating their adverse impacts on population health is complicated. Even so, trends for 15 of the 25 objectives that have targets are moving toward or have met national targets. The Midcourse Review provides an opportunity to assess progress and identify remaining opportunities for interventions so that more can be accomplished by 2020. Addressing SDOH in localities, states, and the nation is an important step toward reducing health disparities. We have made some progress, especially in healthcare and family communication, but there is still work to be done. Learn more about NIMHD’s work to eliminate disparities and improve the health of all groups. 3. U.S. Department of Health and Human Services. Report of the Secretary’s Task Force on Black and Minority Health. Volume I: Executive Summary. Washington, DC. 1985. Interestingly, Healthy People 2020 has a Topic Area for MICH (Maternal, Infant and Child Health) but, there is no correlate Male Health Care. Is Male Health Care unimportant or is this omission something that should be rectified? A growing concern among male patients is same-gender care for intimate health procedures. If Male Health Care is considered for inclusion in Healthy People 2020, please countenance addressing this concern.